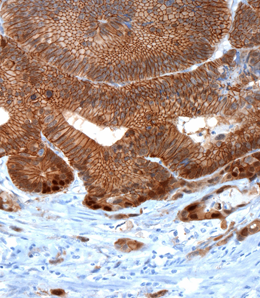 The invasion front of a colon carcinoma stained for beta-catenin. c-MYC and thus AP4 are regulated by the APC/beta-catenin signal pathway. The beta-catenin positive nuclei at the invasion front indicate increased activity of c-MYC and AP4 in these cells. With the aid of genome-wide characterization of AP4’s target genes and direct functional tests, Hermeking’s team have now carried out a systematic investigation of the actions of AP4 in the cell, and uncovered processes relevant to tumorigenesis and cancer progression that are triggered by the protein. Their most important finding is that AP4 plays an important role in facilitating the formation of metastases. Metastases are secondary tumors that become established when malignant cells migrate from the primary tumor to other, often distant, tissues, and continue to proliferate there. “It turns out that AP4 initiates this process: It transforms locally proliferating, non-aggressive tumor cells into invasive metastasizing cells by inducing the so-called Epithelial-Mesenchymal Transition (EMT),” Hermeking explains. Reversible EMTs are a normal component of development. The term refers to a process in which adhesive cells growing in an ordered sheet on an underlying layer of connective tissue acquire the ability to dissociate themselves from their neighbors and penetrate through a so-called “basement membrane”. Such cells are then free to migrate to other tissues, where they may either regain their epithelial character (during normal development) or, in the case of malignant cells, seed the formation of new tumors. The new findings are of considerable clinical relevance. The researchers have shown that colon cancer patients whose tumor cells produced AP4 in large amounts were significantly more likely to develop metastases in the liver after surgical removal of the primary tumor, and had a poorer prognosis, than patients with lower levels of the transcription factor. “Conversely, we found that a specific pharmacological inhibitor of AP4 prevented the formation of metastases in a mouse model,” Hermeking adds. Hence, these results indicate that AP4 is not only of diagnostic and prognostic value, but also represents a promising target for therapeutic interventions. The LMU team now plans to identify further targets of AP4 in tumor cells and determine whether other regulatory molecules, apart from c-MYC, act on the protein.